With its distinctive forty-five degree diagonal crown, the Citicorp building is one of the most recognizable skyscrapers on the New York City skyline. At fifty-nine stories, it’s the third tallest building in midtown Manhattan, and at the time of its completion it was the seventh-tallest building in the world. At ground level, the huge skyscraper almost seems to hover above Lexington Avenue, held aloft by four massive, 114-foot-tall stilts which are located at the center of each side rather than on the corners. This unusual architecture was one of necessity— the structure had to be built around the landmark St. Peter’s Church— but the design left room for a serious engineering flaw which went completely unnoticed during its construction and initial use. Had the weakness not been accidentally discovered and secretly fixed, the mighty skyscraper could have been toppled by a stiff gust of wind without any warning. The building’s structural skeleton was designed by an engineer named William J. LeMessurier (pronounced “La Measure”) in the early 1970s. Making room for the St. Peter’s church was a difficult problem, but LeMessurier was a highly capable and creative engineer. His design called for the building to sit atop nine-story-tall stilts, one centered on each side with a specific geometry in the structure’s framing to take maximum advantage of the oddly placed support columns. It also had a single, narrower column in the center which housed the building’s elevator banks and provided additional strength to the framing. This design made room for the church under the building’s northwest corner, and gave the giant structure a graceful, almost levitating effect. The concept as delivered by LeMessurier was quite sound, in fact it was elegant and technically brilliant. At only 25,000 tons, the steel superstructure of the building was remarkably light compared to other skyscrapers, such as the Empire State Building’s 60,000 ton skeleton. Because of the stilted design and low weight, his plans also included a tuned mass damper, a 410-ton block of concrete housed in the upper floors of the building, floating on a thick film of oil and controlled by an automatic system. This substantial piece of stabilizing equipment was intended to cut the building’s sway in half by converting the kinetic energy of swaying into friction. LeMessurier first became aware of the building’s weakness in 1978, about a year after its completion. An engineering student named Diane Hartley contacted him to ask some technical questions about the design, which he was delighted to address. Hartley’s professor had expressed doubts regarding the strength of a stilted skyscraper where the support columns were not on the corners. “Listen, I want you to tell your teacher that he doesn’t know what the hell he’s talking about,” LeMessurier told Hartley, “because he doesn’t know the problem that had to be solved.” He went on to explain how the building’s framing geometry worked perfectly with the stilts in such positions, allowing it to withstand very forceful winds, even from a diagonal angle. But the conversation got him thinking, and he started doing some calculations on just how much diagonal wind the structure could withstand. He was particularly interested in the effects of an engineering change made during construction which had seemed benign at the time: numerous joints were secured with bolts rather than welds. 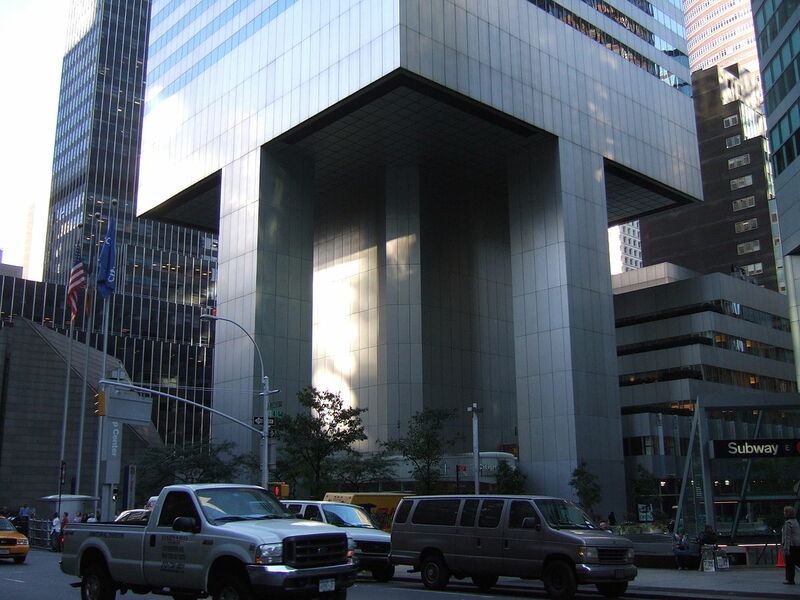 Normally such a change was acceptable, but the Citicorp Center’s design was unusually sensitive to diagonal winds, which the builders hadn’t realized. The results of his calculations were troubling. The force of wind upon a building’s flat surfaces is enormous, measured in thousands or millions of pounds. Wind pushing against a tall building has a great deal of leverage against its base, but gravity does much of the work in holding a building together via compression. This makes a building secure against wind so long as the joints are strong enough to resist whatever wind force is not countered by gravity. LeMessurier worried that the bolts in the Citicorp Center’s joints were insufficiently strong for the task. He took his calculations to fellow engineer Alan Davenport, who was an expert on the behavior of buildings in high-wind conditions. Davenport found that seventy-mile-per-hour gusts would be sufficient to break the bolts holding the joints, resulting in structural failure. Such winds were not unknown in New York, indeed storms with such strength occurred about once every sixteen years on average. Hurricane season was fast approaching, and now only two men in the world knew that Citicorp’s new $175 million tower and its occupants were vulnerable to destruction by catastrophic collapse. Horrified, LeMessurier fled to his island hideaway on Sebago Lake to refine the findings and consider his options. Because he faced possible litigation, bankruptcy, and professional disgrace he contemplated suicide, but he was struck with the realization that he held the information to initiate extraordinary events which could save thousands of lives. The following day he started making phone calls. After speaking with corporate lawyers and consulting with Leslie Robertson— an engineer who helped design the World Trade Center— LeMessurier went to Cambridge to inform Hugh Stubbins, Jr., the building’s architect. Stubbins winced when he heard the news. Together they flew to New York City to confront the executive officers of Citicorp with the dilemma. “I have a real problem for you, sir,” LeMessurier said to Citicorp’s executive vice-president, John S. Reed. The two men outlined the design flaw and described their proposed solution: to systematically reinforce all 200+ bolted joints by welding two-inch-thick steel plates over them. Work began immediately, and continued around the clock for three months. Welders worked all night, and carpenters labored during the day. In case of imminent disaster, an evacuation plan was put in place for the surrounding area, but the general public knew nothing of the circumstances… the press was on strike at that time, so news of the repairs did not disseminate to the populace. About halfway into the repairs Hurricane Ella formed, and it appeared to be on a collision course with Manhattan, but fortunately the storm veered out to sea rather than testing the limits of the half-repaired building. The reinforcements were completed in September of 1978, and the entire structure was re-evaluated for safety. Following the repairs, the building was found to be one of the most sturdy skyscrapers in the world. Despite the success, the crisis was kept hidden from the public for almost twenty years, until an article appeared in the New Yorker in 1995. Diane Hartley—the engineering student who had originally identified the error and alerted LeMessurier—almost certainly saved hundreds of lives and millions of dollars with her sharp eye and intrepid action. As for LeMessurier, the executives at Citicorp asked no more than the $2 million his insurance policy covered, despite the fact that the repairs alone cost over $8 million. It is generally thought that his forthrightness so impressed the executives that they decided to keep their lawyers at bay. Some scoff at the notion that LeMessurier should be celebrated for merely admitting a mistake, but the reality is that he was prepared to assume responsibility for a decision that had been out of his control, thereby saving the city from certain disaster. By many estimations, the character shown by William J. LeMessurier was nothing short of heroic. Unfortunately, the amount of damage caused to New York City by a falling skyscraper is now well known, but in 1978 the idea was still unthinkable. Imagine, however, if such an imposing structure had been blown over by nature itself, from a gust of wind in a storm. Had this engineering gaffe not been identified and resolved, such a catastrophic event might have become a horrifying reality. Update 18 Feb 2014: We discovered the engineering student’s name and revised the article text to credit her for her role in preventing catastrophe. Written by Alan Bellows, copyright © 12 April 2006. Alan is the founder/designer/head writer/managing editor of Damn Interesting. via the frequently-fascinating Cynical-C.	Last updated 09 June 2014. Boy, that building still gives me the creeps. The stilts look just too thin, and it just doesn’t look right when they’re not at the corners. I can just imagine that building twisting and breaking right at the tops of the stilts. Actually it’s a good idea to have a small footprint for buildings when they’re in the crowded city. Leaves more open space at street level, and the wind doesn’t have to blast thru the narrow street corridors. Let’s wait for the next big earthquake shall we? I wonder though, how it could take three months and cost $8MM to weld steel plates over ~200 bolts. Perhaps they were in very difficult to reach places. Well, hooray for intelligent and honest people. I also suspect Citicorp wanted to avoid the publicity that a legal proceeding would generate. Try to imagine if you had to go into the walls of your house and reinforce every 2 x 4 joist. Now try to do it quietly with minimal disruption to your daily routine. This was just on Cynical-C! We studied this situation in engineering ethics course, the man eventualy received a medal for his selflessness, plus he didnt get the blood of thousands on his hands (win-win). Interesting story, i was expecting the building to collapse though. Great story, but one nit to pick: St. Peter’s was not a landmark church around which it was necessary to build. The present St. Peter’s was built (and paid for) by Citibank, after the 1905 building was torn down; it is much smaller than the old one, as the congregation was declining in number mid-century, and was very appreciative of the cash Citibank paid for the site and the building. Citicorp (nee Citibank) and St. Peter’s both have condominium interests in the underlying property. It is true that the design was formulated to allow for a church on the corner of the site, but the church has a much smaller footprint than the original. There are photos of the new and the old churches at this site. Noticed the “landmark” revision, but – sorry – the “exisiting” in the next ‘graph needs strike-through too; the new St. Peter’s was built as part of the redevelopment of the site in 1976-7. WIth the exception of a rather mediocre building in the SE corner of the site, the entire block (Lex-Third; 53rd-54th) was re-constructed at the same time. This story was convered in an episode of Modern Marvels on the History Channel. Still, a fascinating tale. Why are Mr. LeMessurier’s actions considered heroic? Of course, with a 410-ton weight at the top of the building, you could still have a catastrophe should a major earthquake happen to strike. lkeeble said: “Why are Mr. LeMessurier’s actions considered heroic? Agreed. The guy F’ed up and he just fixed it. I do it all the time…just not on such a grand scale. Hero [scoff]! Great story. I think this gives great insight into what separates a good engineer from a bad one. This guy was incredibly lucky to have great cooperation with everyone involved and also to come out unscathed. Engineering screw-ups like this are not uncommon, though thankfully not usually this serious. Almost every engineering firm has had a similar situation where a minor oversight in design or manufacturing leads to a lot of engineering talent and money being spent to fix it later on. Car recalls are a common example. In my book the guy is a hero. The way I see it, a hero is someone who rights a wrong regardless of personal risk. In this day and age most builders or architects wouldn’t even consider revealing a flaw such as this one. This mess could have cost the guy everything he had, it was so bad he contemplated suicide. He did what was right. You don’t see that very often on this scale. I do the same, but almost all of my F’ups don’t have the possibility of causing thousands of deaths and costing millions of dollars. While this was an engineering failure that in the end was made right… what about all the other projects that end up being built by…”the lowest bidder”? You better believe they are going to take short cuts along the way to maximize their profit margin. After all, profits are what drive business (not to mention that profits are what shareholders want)! Random tangent: Another interesting building on stilts is the Sharp Centre for Design at the Ontario College of Art. DID have a sense of honor and thus did the honorable thing. BTW, I would love to shake his hand. If only because he is part of a rapidly vanishing breed. Actually, the story said “200+ bolted joints”. A single bolted joint might have dozens of bolts holding it together. If, for instance, you were attaching two upright steel beams to each other, and you had five bolts (in a square-plus-center pattern) at the top, middle, and bottom of the two beams, that would be fifteen bolts for one joint. It could easily be far more–dozens or scores per joint. Multiply that out, and you begin to see the cost issues. In addition, remember, the building had already been completed, meaning many of the bolts were now deep inside walls with finished surfaces applied. So the interior finish walls would have to be removed, then the plates welded on, then the interior surfaces refinished. Meanwhile, furniture would have to be moved, people relocated temporarily, wires re-run… it adds up fast. Wires re-run… …probably much easier during the 70’s. Imagine doing that now with all the automation. That would be a job in itself. Any idea what 8M in the 70’s roughly translates to in the 2k’s? Nowadays in todays PC, Lie-beral age no one is responsible for their actions any longer. well “robbbbb” that weight at the top is in designs all over the world because it works so well against lateral forces. however the fact that it uses friction to do this worries me a bit b/c of the possibility of failure due to lack of lubricant. pendulum designs of this nature are much more predictable and efficient towards countering lateral loads on the structure. as far as the wires being near the structural connections (perimeter joints i’m assuming) and having to be moved, i highly doubt it. the designers, most likely, ran electrical raceways in accessible areas (near elevator shafts and branching out in strategic areas above the ceiling) knowing innovations are always on the horizon, thus making the structure more “flexible”. haha…..
anyhow these are very intelligent men/women and i’m certain a project of this scale had much planning…except when he apparently spilled his coffee on his calcs. for those connections. I remember watching multiple shows about it on The history Channel years ago. It was an interesting thing though. And, i personally like the building, nice design, different for the city. 1. The building was deigned to use rivets welded into place but due to cost/budget issues and to make the work go faster during the initial phases of building, they switched to screw style bolts which when stress would be applied would snap. 2. The original refit plan called for welding steel plates over the joints to essentially make the joined sections structurally one instead of having just rivets holding them together, when the engineering student and the designer started to investigate they found the presents of bolts over rivets which escelated the structural problem. 3. The refit took longer than expected and more money than expected since not only did steel plates have to be welded onto joints but ALSO every bolt in the super structure was removed and replaced with a welded into place rivet. 4. (and this addresses an earlier comment) aside from #3 about changing more than originally thought, all of this work had to be done in crawl spaces of the building and in some cases interior sections of the building had to be removed to access the super structure; none of this was done with scaffholding on the outside but everything was on the inside of the building. I’ve not seen the special in a while, but the TV version is a lot more detailed and really interesting to watch, they have the wind models and everything to show how the buliding would snap and break. Any idea what 8M in the 70’s roughly translates to in the 2k’s? At current inflation rates, prices roughly double every 20 to 25 years, so $8 million in 1975 is roughly $16 million in 2000. I agree 100%. I’m 45 and have seen a time when this would have been the norm, it is now the exception. Kids today (mine included) seem to feel that the world “owes them something”. And no robbbb, not EVERYTHING is the fault of the liberals, but you can sure trace a lot of this type of thinking back to them now can’t you? Kudos to you USNSPARKS for telling it like it IS. HarleyHetz said: “I agree 100%. I’m 45 and have seen a time when this would have been the norm, it is now the exception. Kids today (mine included) seem to feel that the world “owes them something”. And no robbbb, not EVERYTHING is the fault of the liberals, but you can sure trace a lot of this type of thinking back to them now can’t you? Kudos to you USNSPARKS for telling it like it IS. Hmmm, yes. How many things do you think the french upper-class in the 1500s could get away with? How many affaires do you think King Louis XIV could have besides his marriage before getting held responsible for it? Rich/important/high-class people have been getting away with things since the first civilizations, it’s not just of late. Other than that: The guy didn’t really have a choice, first of all there is such a thing as conscience, then there’s the thing called pride in work, he was obviously a man of his trade. But most of all there’s that little fact that he’d be f*cking lynched if somebody would find out, whether before or after the inevitable collapse. Not to bash him or whatever, I don’t know the guy, perhaps he really did have a sense of honour and heroism, but I’m just saying that it’s not something you can assume. How are LeMessurier’s actions heroic? He made an error in his arcitectue, so he fixed it. It was not a matter of moral fiber or character. If he were not to fix his mistakes, the building would collapse and kill thousands of people, thereby digging a deep grave for LeMessurier. On the otherhand, he admitted his error, got in (comparitively) a little bit of trouble, fixed the problem, and no one got hurt. Any sane logical person would do the same. Would ‘USNSPARKS’ and everyone else who tries to inject politics into these threads please just shut up? Such comments are irrelevant and rude. The topic of this article is engineering; if you want to rant about politics, please visit a site where that is appropriate. Thanks. Interestingly enough, the architect who designed the Nimitz Freeway that collapsed during the Loma Prieta Earthquake was interviewed later, and he said that he knew that there wasn’t enough structural steel in the columns when his design was constructed, but he didn’t care and couldn’t be sued because of the statute of limitations. It’s a dangerous thing to assume that everyone has a conscience, just because you and I do. And darnit, I should’ve read further before posting my own. Apologies to the list…. Engineering-wise, though, I do have an amusing story about bolts snapping. In my college Materials Science Lab I was supposed to create something as a final lab. I put together this really cool idea that would keep wheels on cars without having to whip out the tire iron to undo the lug nuts. It seemed pretty neat, except that my calculations showed that it would snap in two if it were ever used. In a fit of cowardice, I submitted the paper anyways, even with the calculations, and still got an A.
It’s pretty interesting (although not damn interesting) that bolts work based upon how much pressue is applied to the threads, as well as the cross-section. If there isn’t enough thread surface, then the force keeping the bolt tightened makes for greater pressure against the threads, and they can shear off. If there isn’t enough bolt cross-section, then the pressure can snap the bolt. Welding the rivets would make the most of the cross-section, because then the pressure and shear forces are spread across the entire surface of the rivet, not just the thread or the neck. I’m confused; in Australia the “Liberal” party is actually the biggest conservative party we have (and the one that’s running the country… woo. *sarcasm*) so in America is “Lie-beral” conservative or ACUALLY liberal. Coz I don’t think liberalism is a bad thing…except when it comes in the form of John Howard. John Howard is the Prime Minister of Australia, aka George Bush’s lapdog. HarleyHetz said: ” And no robbbb, not EVERYTHING is the fault of the liberals, but you can sure trace a lot of this type of thinking back to them now can’t you? Kudos to you USNSPARKS for telling it like it IS. What a bunch of idiots. “You can trace this kind of thinking back to the liberals’? Oh, and I suppose that if you vote Green (um, that’s the left-wing party in Australia. Marginalised through smear campaigns, although all their predictions (massive drought in Australia, climate change, ozone depletion etc) have come true.) then that means you’re a tree-hugging, pot-smoking, communist hippie freak? HarleyHetz, trans-fat is just about the worst thing you can eat, and with America being the fattest nation on earth, maybe you should open your selfish, sheltered yankee eyes and see that THE WORLD IS F***ING DYING. Yes, that’s right; so you can shut your mouth (or typing fingers), get open your eyes a little wider, and see the damage that people (particularly your country) have inflicted upon the world. I bet you vote for George Bush, eh? And actually, from a liberal point of view, everyone SHOULD be held accountable for their actions, particularly world leaders. Sorry, anthemion, couldn’t help it. He’s a hero because he courageously saved the lives of thousands of people. If Citicorp had been really pissed, they could have ruined him financially, personally, professionally. But they were man enough to accept that there was no point to doing that… other than vengeance for the $20 mil equivalent they spent fixing his mistake. So the execs at Citicorp need to share the credit for the outcome as well. Any time we start treating excellence as merely “good enough” we remove the point to excellence. Excellence deserves recognition, wherever we find it. The thing I found astonishing was that they allowed the engineering change without doing those calculations in the first place. The Law of Unintended Consequences should have been well taught by those in the aircraft industry. Sometimes the smallest change can lead to disaster. Where life is at stake, extra care is warranted. The fact that there is a need to teach such a thing as ‘engineering ethics’ is interesting to me. I have seen engineers do plainly wrong things for political reasons; and I have seen incompetent engineers rewarded over competent ones for political reasons. But I wonder who writes the ethics books? Perhaps the guy is a hero because he had to swim upstream against the political and social current to fix the problem. Personally, I think overcoming cowardice is not heroic. But of course, I would probably not have been chosen for such a project, not having the stomach for dealing with committees. At least, the man deserves respect for having the intellectual honesty to revisit the question and re-run the calculations himself. I know a lot of engineers who avoid reading almost as much as they avoid performing calculations, and who treat any outside analysis of their handiwork as a personal insult, rather than as an opportunity to learn or teach. And that intolerance gets viewed by the unknowing as confidence borne of experience. So they are richly rewarded for it. Such a man would never have questioned his own work after the fact. Again, for that he deserves respect. What to do after he reached the unpleasant conclusion is plainly obvious, even if it took him a few days to get going. I don’t think liberals or conservatives have a monopoly on rigid adherence to a strict personal code of honesty and integrity. There are plenty of examples of skulduggery in both camps. It’s just that some of them are more shameless about the ways in which they seek to reward indolence and pardon dishonesty. While the others are busy putting Orwellian measures into effect to enforce religious edicts. And neither side rolls back the gains made by the other whenever they get control, instead the power gets ratcheted up first by one side, then the other, with no relief. How very tiring. The coverage is fairly shallow, but I found it surprisingly interesting. Be sure to check out the lists. Coherent said: “He’s a hero because he courageously saved the lives of thousands of people. If Citicorp had been really pissed, they could have ruined him financially, personally, professionally. Citicorp would have been infinitly more pissed if the building had collasped. They could have ruined him financially, personally, and professionally to an enourmeously greater degree. Ok, for everyone who keeps saying that he’s not a hero because it’s only the logical thing, etc. Humans are not logical creatures! Most of our decisions are made subconsciously and the ones that are conscious are usually more emotional than logical. The gut response to something like this is to run away and hope it never catches up to you. Think about all the times that you’ve made a mistake that could humiliate you publically and you tried to cover it up and hope the consequences don’t catch up to you. And if you say you’ve never done it, then you’re deluding yourself or never pretended not to notice when you let out a silent one in public. See, the logical thing to do in that situation is to loudly proclaim that you farted to protect and prepare those around you. Instead what most people do is keep their mouths shut and *hope* that the smell doesn’t go around. Now take that feeling and multiply it by a gazillion, enough to make you wanna kill yourself, and that’s what the guy probably felt. He’s a hero precisely because he chose to follow logic and to listen to his other emotions about saving lives and his integrity rather than to follow the (very strong) emotions telling him to protect himself. The building collapsing would be inevitable. The consequences catching up with the architect would be inevitable. He was protecting himself. Anyone would do the same. Difficult to reach, yes. We’re also talking about 2-inch-thick steel, which is neither cheap nor easy to handle. Also, I’m betting this also required the labor to be done by structural welders. What they do is considerably different from what you are seeing done on American Choppers. $8Mil sound like a lot, but when you consider the scale of the work and sensitivity. I’d also say they we’re not interested in cutting ANY corners at that point and somewhat at the mercy of the company willing to take on the job. Aside from that, amazing story. *sigh* Everyone always talks about the “good old days”. Yes, the good old days, where corruption was just as rampant and racism the norm. Every damn generation says there time was better than the last. Why? Probably because once they are older, they are less ignorant of the world. Not only that but at the rate news spreads in the world because of TV, radio and internet, you get to hear about all the worlds screw ups not just the ones around your city. This story was made into a Numb3rs episode. Season 1, episode 4. They moved it to LA but modified very little of the story. In New York?? We’ll be waiting a while. For one other example of downtown construction taking an existing church into consideration see Promenades de la Cathedrale in Montreal. Picture taken during construction. How interesting that the press was on strike at the same time the repairs were being made. Oh, and Scharneeigh, though your comment was off-topic, I loved it and I totally agree with you. On what do you base your claim that it would have been inevitable? Sufficiently powerful storms were due only every 17 years and even then an accident would not have been assured. Many people would have tried to sit it out – in fact this site is teeming with stories of desasters where people tried to sit it out, blame others or simply deny responsibility. I’d use the title “Hero” a bit more sparingly, but what he did was very courageous and deserving of respect! Let me suggest reading some of the literature available to the public from the American Institute of Architects, or the Associated General Contractors, beginning with standard contract forms A201 and A201. There is a lot more to construction projects than what you seem to be inferring. If the Construction Documents are sound, there is nothing wrong with having it built by the Lowest Qualified Bidder. Most things are. On any project of any substantial scale, “shortcuts” are not taken lightly by a good builder, who has a lot to lose if something isn’t right. His best approach is to do prepare his bid thoroughly, seeking all possible clarifications to the Drawings amd Specifications during the Bidding Period. If he gets the job, he should continue to seek clarifications, and if there are necessary changes adding to the cost, there is a standard process by which he is paid for them. He does not actually stand to gain much at all by installing less than what he is under Contract to do. In fact he would be guilty of fraud. If the Contractor proposes a substitution and it is accepted, he would be required to provide a credit. It does not go into anyone’s “profit”, it goes back into the Budget for Construction. Otherwise, there is malfeasance. The vast majority of contractors win their contracts by being the Lowest Qualified Bidder. What you seem to be saying is that the vast majority of contractors are criminals in collusion with the building owners. Unfortunately, that view is common among people whose ideas are formed primarily by the mass entertainment outlets. I personally believe that competition fosters innovation and counters inflation. As for profit, it is a clearly delineated feature of accounting (with the exception of a few criminals) and it allows people in this country to remain employed and for taxes to be paid. I made a correction. Happens. UGH!!!!!!!!!!!! stupid website page name!!!!!!!!!!!! I have to get facts but i have to get the website name to but this website name it to NAUGHTY so i cant use this PAGE !!!!!!!!!!!!!!!!!!!!! STUPID NAMEEEEEEEEEEEEE!!!!!!!!!!!!!!!!!!!!!!!!!! But -“Unfortunately, the amount of damage caused to New York City by a falling skyscraper is now well known”- a collapse after controlled demolition is not a fall..
amesegenalehu. des yemil minebab new. No, it is not the English word ‘new’. And yes, once the building is complete, those joints are likely under several layers of wall, cladding, wiring/piping/ducting, etc, and in confined-access spaces. trespassa said: “Interesting story, thanks! Have you forgotten 9/11? That was by no means a controlled demolition. Debbi Lund said: “trespassa said: “Interesting story, thanks! I think 9/11 is exactly what they’re referring to. I don’t believe it was a controlled demolition, unless terrorists crashing a 767 into a building is the way it’s done now. When I went to New York this year, I made sure to go and look at this building, just because I had read this article. It is quite something to look at. I recall watching an amazing TV documentary on this year’s ago, showing how they needed to crawl inside the spaces under the skin that were never expected to have people in them. It was pretty impressive to see video of the welding sparks flying in inside the walls of the building in the dead of night. And phenomenal that they were able to accomplish this without raising an alarmist panic by everyone living in what would have been the crash zone, and even managing to instantiate and disseminate an emergency evacuation plan under the guise of a more seemingly innocuous justification. THe integrity of Mr. Meessurier can be contrasted with the lack thereof exhibited by executives at NASA and conrtactor Morton Thiokol thirty years ago to proceed with the launch the space shuttle “Challenger” in spite of their knowledge that the launch might result in a catastrophic failure – which it did.